Nippon Thompson Co. Ltd. is committed to developing products that make its customer’s machinery and equipment more reliable; thereby helping to preserve the global environment. Just one example of this approach is the term “Oil Minimum”. IKO’s Oil Minimum ethos has led to the creation of a proprietary family of lubricating parts named “C-Lube”. “C-Lube” minimizes usage of lubrication oil and supplies the optimal amount of lubrication oil for long periods of time. This enables a long term maintenance free life whilst also helping to preserve the global environment. 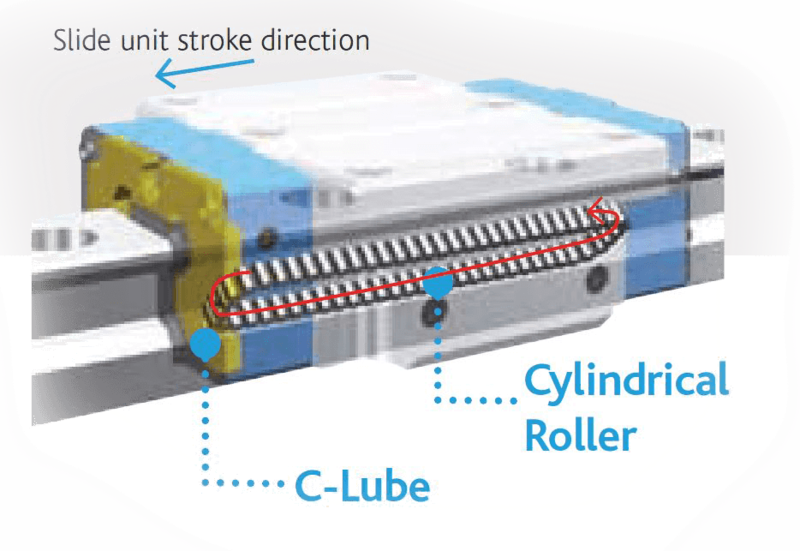 By replacing the interchangeable linear way or linear roller way slide unit with C-Lube Linear Way or a C-Lube Linear Roller Way slide unit, maintenance free operation is achieved; while still using the same track rail. covered with the lubrication oil. 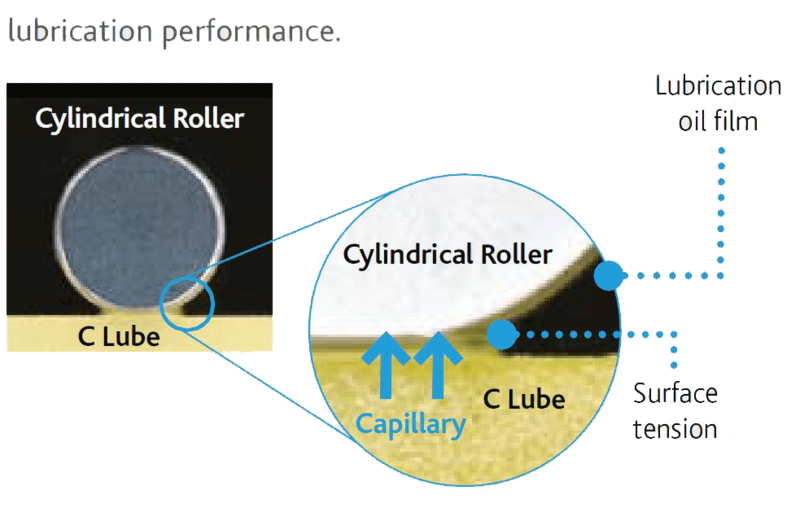 The surface tension in the contact of capillary lubricating elements, surface and rolling elements ensures continuous overall lubrication. On the surface of capillary lubricating elements, with which the rolling elements make contact, new lubrication oil is always supplied from the other sections. Lubrication oil is supplied to surfaces of rolling elements and carried to the loading area through the circulation of rolling elements. Appropriate levels of lubrication oil are thereby properly maintained in the loading area, delivering long lasting lubrication performance.